Eric is into Mopar muscle cars, and has been driving Dodge trucks, as his daily drivers, for about 30 years. He has had many cars and trucks over the years. 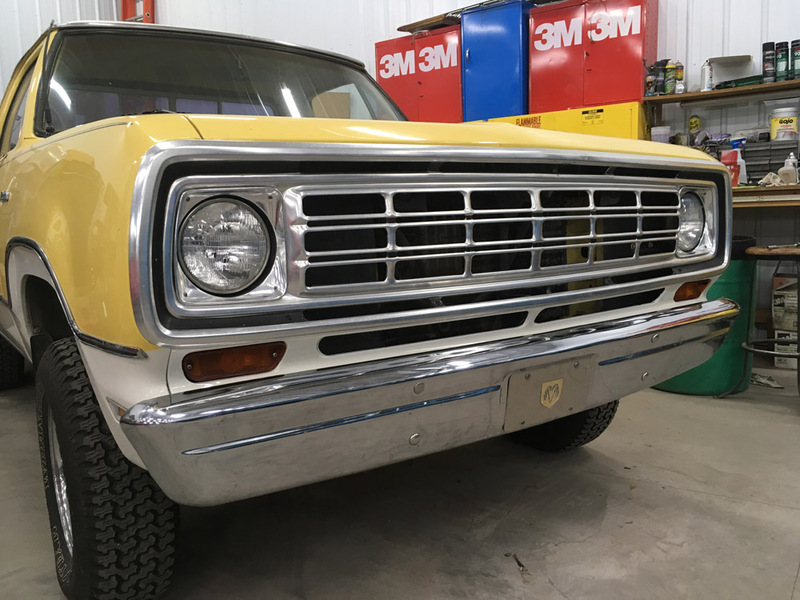 Eric's favorite old trucks are the Dodge Power Wagons from '72 to '78. 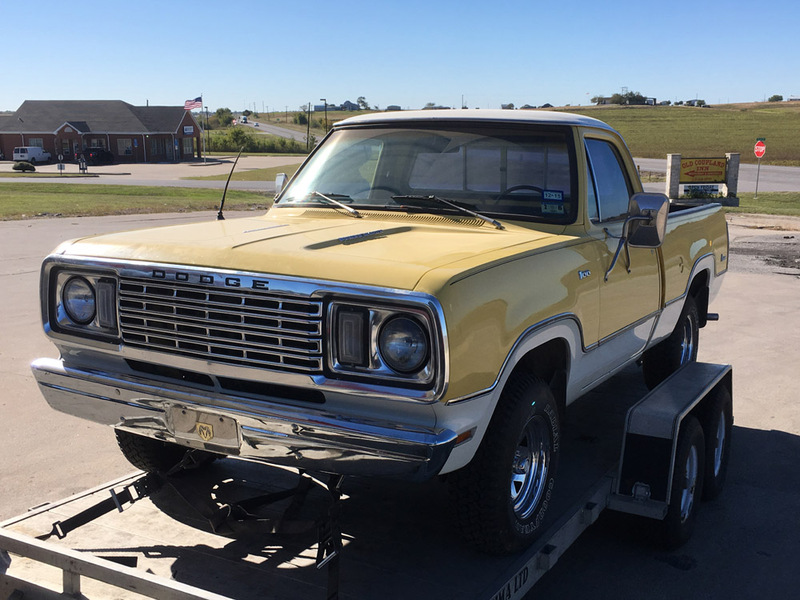 Eric graduated from High School in '75, so he made 1975 the year truck he wanted to find. 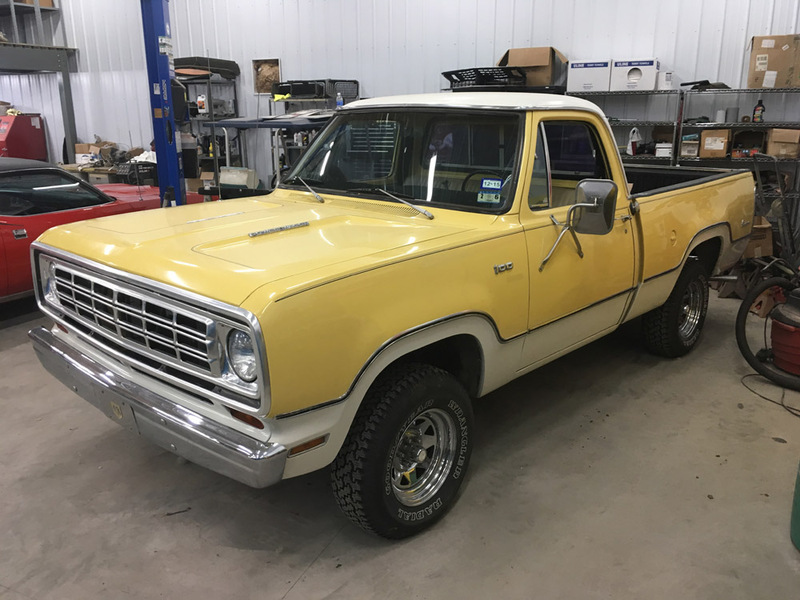 For years, Eric has been looking for a short box, regular cab, 4X4 with a V8 and automatic, that was rust free, and in great original condition. As you probably know, there aren't very many like that out there! Everything he came across was either rusted out, beat up, used up, or restored and modified. In the back of his mind, he really wanted to find one with factory A/C, and a 360 or a 440, if it existed. After searching nationwide on and off for several years, a truck finally popped up in Texas that had potential. 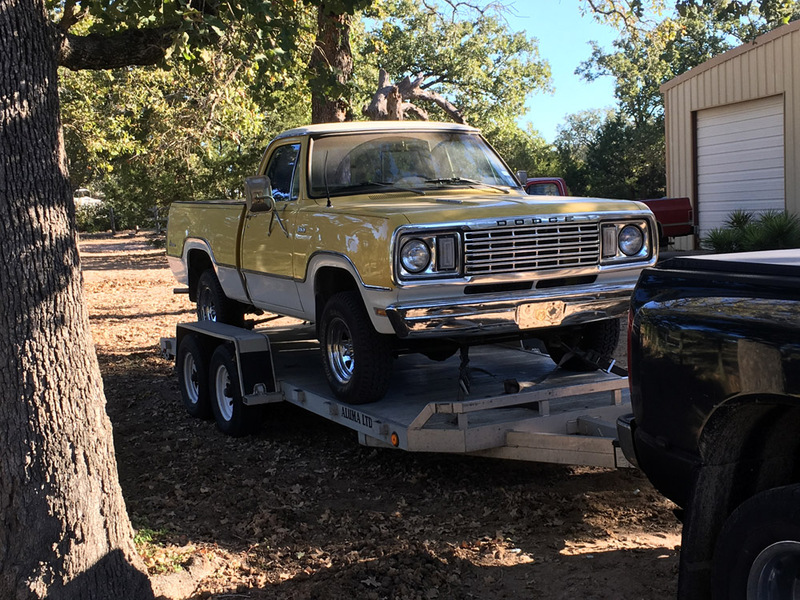 It was a rust free, 1975 Dodge Power Wagon, 4X4, regular cab, short box, 360, AT, A/C nice original truck! It had the Adventurer two tone paint package, and a slider back window. The odd thing was; it had a '78 grill and lower front valance installed on it. That didn't bother Eric. He was hoping the front end hadn't been crashed, and that it wouldn't have other issues. Eric knew he would need to go to Texas, to see the Power Wagon in person. The seller agreed to hold the truck for Eric, while Eric arranged the trip South. Eric talked his friend Joe into traveling with him, with his trailer in tow. Starting at 4AM, they drove 18 hours straight, and got to within 30 miles of the town in TX where the truck was at, and spent the night. They got up the next morning, and went to see the truck. Their GPS guided them way out into farm country, and back into the woods. They were getting concerned, because they were carrying cash, and it looked like they were heading into nowhere. Eric and Joe finally found the seller's place, and he had them pull the truck and trailer into his fenced yard, and up to the garage area. He opened the garage, and DROVE the truck out. It didn't take Eric more than a 5 minute walk around, to know he was buying the truck! He took the truck for a short drive, and made the deal. They loaded the Power Wagon onto the trailer, and started back North. On the way home, Eric wanted to stop in St. Louis, and look at a '70 Cuda he was interested in. They stopped there the next day, to see the Cuda, and bought it also. 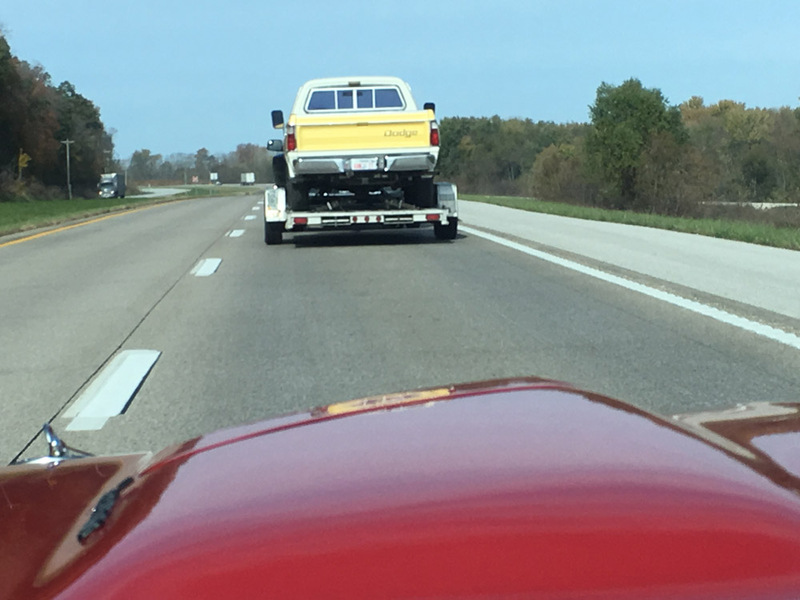 Eric's friend, Joe, drove the truck with the new Power Wagon on the trailer, with Eric following, driving the Cuda, the remaining 500 miles home! They got home safe and trouble free, after traveling 3 days. 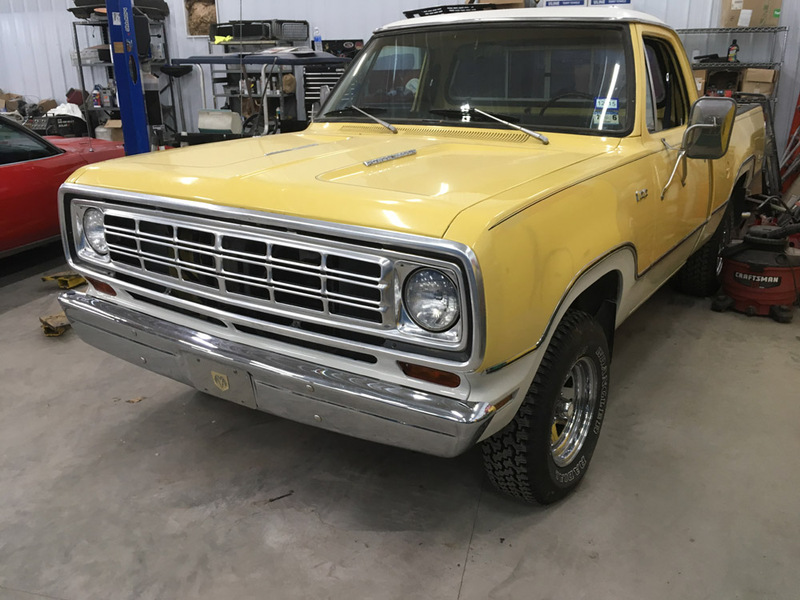 Eric searched on eBay, and found a nice 1975 grill in Indiana, a lower front valance in Texas, turn signals in Missouri, and headlight bezels in Oregon. The parts arrived safely, Eric painted the valance, cleaned up the other parts, and put them all on. The truck looks GREAT! It's back to looking like a 1975 should! Eric found a beautiful steering wheel, and replaced the cracked one in the truck, and installed an original antenna. There are a few more things Eric wants to do to his Power Wagon, like installing new weather stripping. He will do the additional work this winter, in his shop in Wisconsin. Eric's truck is a very nice original Power Wagon, that has had one repaint several years ago. 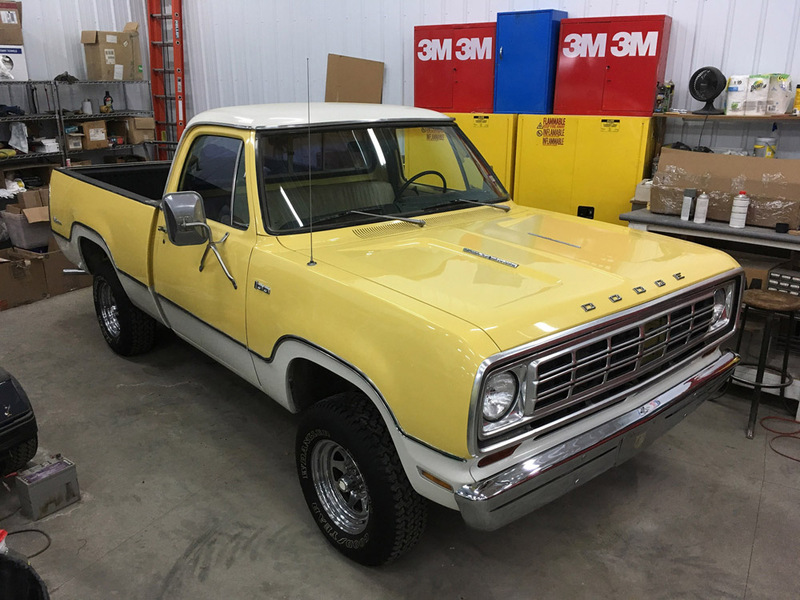 Overall, the truck is in great shape and has been well taken care of for the last 42 years. 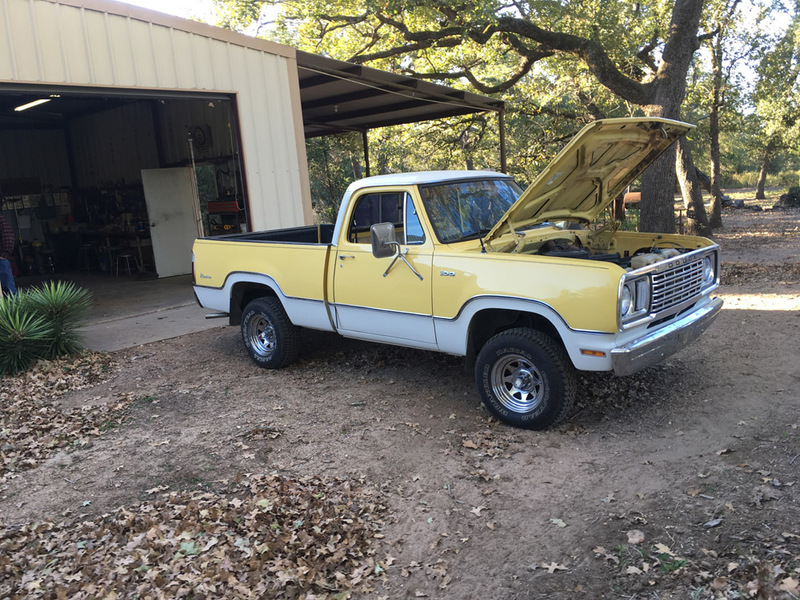 The truck doesn't need to be restored, and it is 100% rust free. Eric won't be driving it during the Wisconsin winter. Eric has another truck for that. Summer time use only is this trucks future! 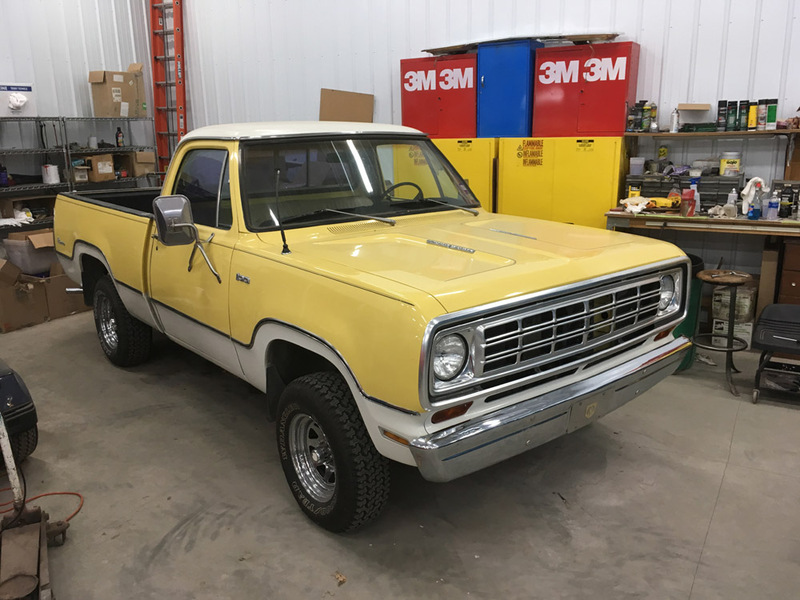 Eric's 1975 Power Wagon is the truck he was looking for, and more! 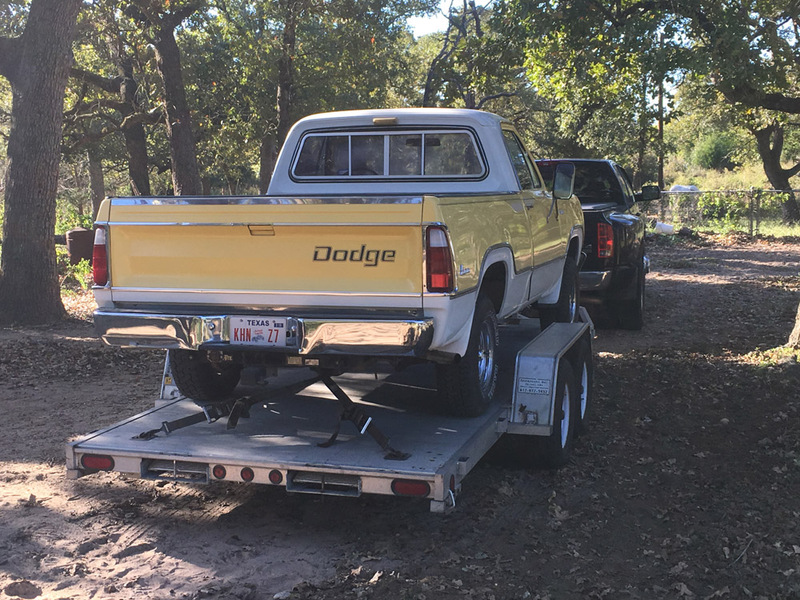 Attached are pictures of his truck from the trip to Texas to pick it up, and a view of the truck from the seat of the Cuda, following it home. There are also a good before and after picture of the front of the truck. Eric will get some more pictures of his truck in the shop, once he moves things around. 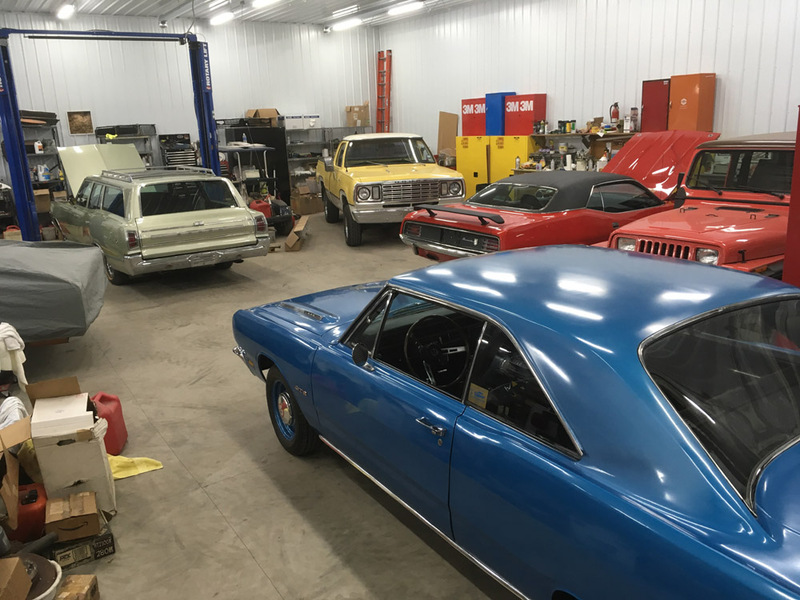 Eric is working on a '69 440 Dart GTS, a '69 440-6 bbl Road Runner, the '70 Cuda, and the Power Wagon right now. He also has a '89 Shelby Dakota as well as a few more cars and motorcycles. He has plenty of projects to keep him busy! Below are pictures of the truck after Eric put the original antenna back on, took off the girly mud flaps, and cleaned the winshield. 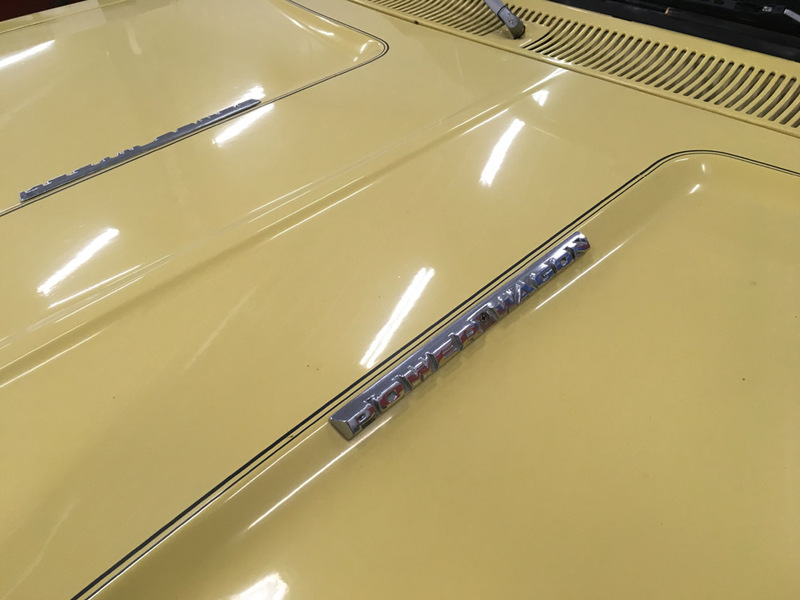 UPDATE (April 2018): Below is the latest picture with the pinstripe removed and the "DODGE" letters put back on the hood.